Writer and Producer: Matthew Bartlett. 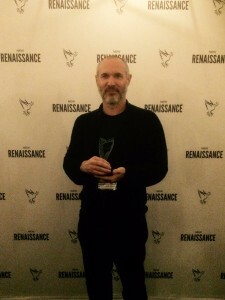 Congratulations to you Matthew and the team on winning BEST NARRATIVE UK SHORT at the recent New Renaissance Film Festival held in London. How does it feel? To have Ministry of Guilt win this award is very exciting; it makes all the hard work from all our creative team worthwhile. We have had such a great team making Ministry, I’m just really happy for everyone that we’ve made it this far! And it also means a huge amount that someone outside of the film has watched it and found merit in it. That means a lot. What was the process that led to you writing “Ministry of Guilt” and getting it made? Ministry of Guilt director Detsky Graffam and I were looking for a project to collaborate on and we had a whole list of ideas. Some of which are best left in the filing cabinet! It probably started with Kafka via Orwell’s 1984. The absurdity of Sam’s predicament then pushes past Orwell and I like to think that the Ministry of Guilt is a department working out of Terry Gilliam’s Brazil. I sketched a rough script, originally entitled The Wrong Door, and we started from there. Detsky is a fantastic director to work with, I think I went through around nine drafts to get to the shooting script, he kept pushing the script, asking questions, and I think that process is reflected on screen. We’re immensely proud of how Ministry of Guilt turned out. How did you break into writing screenplays and producing film? I started out acting – lots of theatre. Then moved on to writing plays, then some comedy, then films. I like writing stories. Making something out of nothing. I think the joy, for me, of being part of this process, is seeing something through from conception to reality. And working with a lot of very talented people along the way, who all have a very real part to play in bringing that to life. It’s a uniquely collaborative experience. Have you always had an interest in film and film-making? I certainly didn’t have an epiphany moment when I knew that I wanted to be involved in film but my first memory of a film that genuinely excited me was The Empire Strikes Back. I was (slightly) too young for Star Wars but I remember walking out of Empire and being crushed that I’d have to wait for Jedi in order to find out what happened next, I guess I was hooked from then on! Harrison Ford/Han Solo was the only actor/character to be at the time, so inevitably, Indiana Jones also became a huge part of my youth. I begged to go and see Blade Runner but I was too young – that would have to wait for a couple of years. It was a time that inspired me to be an actor rather than a writer but they were certainly my formative films. What do you think is the hardest thing and the best thing about being a filmmaker? I think giving over any kind of artistic endeavor to anyone is hard, whether that’s a piece of writing, or a painting, or film, whatever it is, it’s hard. And that doesn’t get any easier as you get older! I think you’ve got to be happy with what you hand over before handing it over – or else it can be a painful experience. But as with all art, there is a certain joy in giving it up and seeing the reaction of others. Mostly. Sometimes. What advice would you give to a filmmaker? Preparation. Detsky is a wonderful director and the shoot wouldn’t have worked without his intense preparation. Due to this, we were able to work efficiently and when a problem presented itself, we were able to work around it. It helped to have a great crew working on the film, without all of them, it just wouldn’t have been made – they were awesome. Also, take your time. Make the very best piece of work you can with the resources you have available. Try to have fun. What kind of reaction do you want people to have watching “Ministry of Guilt”? I hope the story keeps people intrigued to the very last frame. I think Alex Beckett’s performance is fantastic, he’s a wonderful actor with a huge amount of talent. I hope people enjoy the film, that they remember it when they leave and that they talk about it later. I’ve got a new short in pre -pre-production, I’m tweaking the script and drawing the storyboard. I’m going to direct this one, so I want to make sure I’m well prepared! I’m working on a couple of feature ideas that are all at the treatment stage, and deciding which one to go into script on and I’ve got a couple of collaborations on the go too, so lots to do. But the short is first, we’ll be shooting (hopefully) before the year is up. The New Renaissance Film Festival showcases inspiring artists, stories and storytellers from around the world. Our next festival will take place in Amsterdam and is now accepting entries. Click here for details on how to enter your film or screenplay. 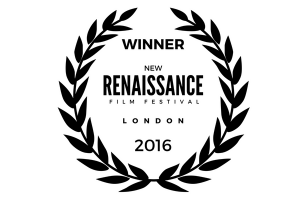 What are people saying about NRFF? Click here for the latest festival news.